VALENTINE’S AROUND THE CORNER – £19.50 FOR THREE COURSES. Where are all the lovers? Valentine’s is just around the corner, book a table and don’t be disappointed. Lovely fresh flowers and chocolates on the tables. Romantic setting with lovely romantic music playing in the background. Candle lit tables – what more would you want. Try our beautiful local oysters as a starter and see if they work!!! Sizzling bananas for a Valentine pudding are a must. Watch your partners face when they are served in front of her. Lots of wonderful choices for your perfect Valentine meal. Happy New Year to everyone. We re-open on 9th February having closed for January after a very busy Christmas Spectacular looking after all their customers and cast. It has been brilliant and great fun and John Cushing has been marvellous in his support for our little restaurant and B&B. Thank you very much. Don’t forget Valentines. Book early as we have an amazing three course set menu as well as our A la carte which is only £19.50 for three courses. This sort of price is very hard to find for freshly prepared meals with fresh vegetables and potatoes and home made starters and desserts. Try our sizzling bananas in cointreau and cream as a special valentine dessert – yum, yum and very appropriate!! Book a room as well and make it a special occasion with fresh flowers and chocolates in the rooms. Look forward to seeing you all. Why does everyone turn their noses up when I tell them we have a special of one dozen snails in garlic and tarragon butter for a starter. They are absolutely gorgeous with a big dunk of home baked bread. Come in and give them a try, it is worth it. Give us a call and come and stay in our Bed and Breakfast at a special rate. 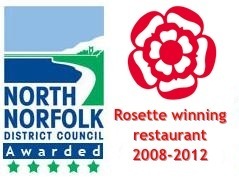 We will tell you how to get to beautiful Morston quay where there are wonderful walks, you can visit John and buy some lovely local mussels, or take a seal trip from Morston, it is a lovely area and we are only ten minutes away. When you come back in the evening you could always enjoy us preparing you a big bowl of moules mariniere to welcome you home.